Another year is almost over, and a new one is on the horizon. I hope you had a fun 2003, and that your 2004 brings you plenty of new joy and happiness. Keep on gaming! It's not much, but I did update the MAMEframe2 Construction Diary a bit, adding in details about the sound system and the speakers used. I've also added a "parts list" of sorts, detailing the components used in the cabinet and computer. MAME .78 "Xmas Tree" Edition! Yup, the MAME Devs have decided to offer up their version of holiday cheer, releasing the new .78 version of MAME yesterday. It looks like it's got a number of changes, particularly to the CHD files used by newer games. Check it out over at the official MAME site. Marcus Tiller, always vigiliant to MAME changes, has quickly updated his UniVert "Universal Vertical Bezel" utility to match the new .78 version of MAME. As always, it can be downloaded from the RetroBlast Files Page. Thanks, Marcus! Well, Christmas is winding down here (except for the upcoming bargain-hunting shopping frenzy, which I try desperately to avoid). I got my Dr. Who pinball machine the day before Christmas, which in itself was a bit of a Christmas miracle. I hope you had a good holiday, and try to recoop a bit before New Year's! 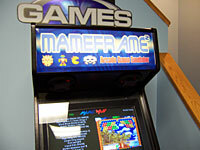 Just got my custom MAMEframe2 marquee that I ordered from ClassicArcadeGraphix.com, and "wow" is, frankly, an understatement. This is a very, very nice product! The printing is fantastic, the colors perfect, and the materials used are top-notch. Everything about this marquee screams "quality." Well worth the money, and it was reasonably priced at that! If you need arcade artwork, I would certainly recommend that you check them out. Well, I finally got a life-long dream: I am now the very proud owner of a pinball machine! 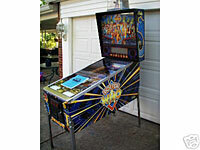 As much as I am distrustful of eBay, I went ahead and won an auction for a very nice condition 1992 "Dr. Who" pinball machine. I won't get the machine in time for Christmas, but perhaps before New Year's I can be "playing the silver ball." I've always wanted a pinball machine, so it's going to be hard to wait patiently for it to arrive. Here's a nice Christmas present — David Butler has updated his great MAMEWAH Setup Utility, and you can grab a copy of the new version from the RetroBlast Files page. It looks like he's made a lot of updates and improvements — you can get the full details from his web site. If you use the MAMEWAH frontend (or want to give it a try), this is a great utility to quickly get MAMEWAH set up and running. Thanks, David! There's a bit of confusion going on, and I don't yet know the winner of the X-Arcade giveaway. Of course, this means you've got a last chance to enter if you haven't already. I don't know when the cut-off will finally happen (perhaps 11:59pm today, perhaps sooner), so enter quickly! This is the last day to enter the "Just in Time for Christmas" X-Arcade giveaway. The drawing will be held tomorrow, so click here to enter if you haven't already! I'll announce the winner on the front page. Just a note to let you know that I have made some upgrades to the Vortex... The flywheel is now machined from one piece of 6061 aluminum. The less dense aluminum gives it a slightly lighter feel like you found on the Tempest spinner, although the mass is the same. It is a very curious phenomenon which is hard to explain in words, it has to be "felt", but the Vortex now feels even more like the original Tempest spinner which you experienced first hand. Additionally, I increased the thickness of the sheet steel used to make the spinner bracket so it is now a perfect match for the original. Previously I went one gauge thickness less than the original to make the spinner lighter because I didn't feel that 14 gauge steel was really necessary, but since I was already making other revisions, I opted for this one as well. It looks great, and I'm sure it improves on an already impressive spinner design. In addition, it appears that Oscar Controls is now selling Vortex spinners to a commerical arcade cabinet manufacturer — no names mentioned yet, but it's nice to see Oscar Controls "hitting the big time!" Congrats, Kelsey! If you're looking for a great Christmas present, don't forget to enter the "Just in Time for Christmas" X-Arcade giveaway. The drawing is in two days (the 17th), so click here to enter if you haven't already! I'll be sure and let you all know what the final product looks like installed in the cab. My solution? 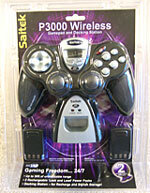 I just got a Christmas present for myself: a Saitek P3000 wireless joypad. This is an extremely cool piece of gaming hardware — an RF wireless gamepad with dual analog joysticks (great for Robotron), two rechargeable battery packs, and a USB docking station that also doubles as the charger. All this for about $35. I've had a chance to look over this new switchable 4 way/8 way joystick design from Ultimarc, and wanted to post my first impressions. I'm very impressed with the switching system: it uses a small pin and socket setup on the bottom of the joystick handle — to switch from 8-way to 4-way, you simply grab the joystick handle, pull up, and twist clockwise until it "clicks." 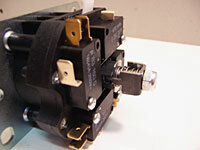 To switch back, just pull and turn counter-clockwise. It's an amazingly simple, elegant method of switching the joystick restrictor plate, and it doesn't interfere at all with the microswitches. I'm looking forward to "playtesting" it. A special delivery today from England: three joysticks from Ultimarc, the T-Stik Plus Mark 2 (the prototype, no less), the E-Stik (Easy Mount), and the J-Stik (Japanese Oval top). 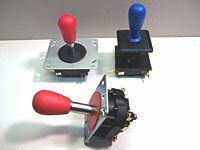 Basically, everything Ultimarc offers except their Euro-Stik (which is a Suzo System 500 joystick). 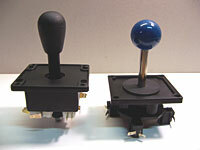 I now have all of the joysticks that will be included in the roundup, so the testing can officially begin. I'll start working on mounting them all to the "test panel" shortly. I'll be using both an Ultimarc I-PAC encoder and a GroovyGameGear KeyWiz MAX 1.5 encoder for testing. Stay tuned. I've just completed a review of ClassicArcadeGraphix.com, a company that offers great MAME-related artwork, such as marquees, side art, bezels, and even control panel overlays. If you've got a MAME cab (or an original arcade game needing some replacement repro artwork), they've got some really great stuff — be sure and check out the review. Congrats to Dennis Campbell, winner of the ArcadeVGA card from Ultimarc. This wraps up the "Share the Wealth" giveaways, at least for now. I'll have more giveaways in the future. Today is the last day to get your entry in for the ArcadeVGA "Share the Wealth" giveaway (visit the RetroBlast front page for details on how to enter). MAMEroom (makers of the Ultimate Arcade cabinet plans and templates) have come out with new plans for a Virtual Music Jukebox. I'm currently working on a review of the plans, and the level of detail is amazing — the construction plans are 34 pages long! I'll post here when the full review is finished, but my first impression? Very, very comprehensive! It looks like Namco is going to be bringing back Space Invaders to an arcade (or home) near you: They plan on selling 10,000 new Space Invaders arcade machines in the US, at $2772 a pop. Inflation has taken its toll, as well, as each play will cost you $.50 now. 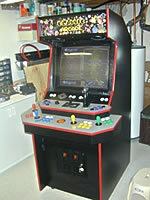 David Shultz sent me this interesting picture of his MAME cab, which he estimates is about 85% complete. "It works out well, I really like the flight stick. I have had four players play comfortably for a couple of hours. Once I get the sideart done I will post it on build your own forums also. The only negative is I should have made the bottom level about an inch deeper for more room with the trackball." The cabinet looks extremely professional, and I always like to see such creative innovations in design. Good job, David! It looks like the SlikStik crew were busy over the holidays — they've now got a contest going on for the best animated SlikStik GIF "badge" (88x31 pixels). The prize is a Tornado spinner. Check out the contest post in their new forums. It looks like they've also overhauled their site, with a new shopping cart system, forums, and some new "bundle" offers combining the SlikStik cabinet and control panels. Something big is developing over at MAMEreactor — they're hard at work on setting up a ROM sharing setup for programs such as Shareaza. The catch? All the ZIPs must be identical for sharing to work. The solution? MAMEzip, their newly developed program that re-zips your ROMs so that they are identical to other MAME ROMs on P2P networks such as Shareaza, meaning that the ROMs can be easily shared. If you're looking for an easier way to keep your ROMs up to date, this could be it. If you're looking for some help getting MAMEWAH up and running, there is a nice tutorial over at the Screenshot Archive site, as well as a help page and (best of all) some very nice MAMEWAH skins to change the layout and appearance of your MAMEWAH display. Thanks, Stuzza! The written review of Space Tripper by PomPom Games is now available on the Reviews page. If you haven't already, be sure to also check out the video review as well.